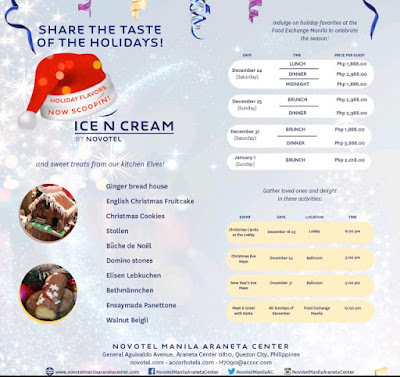 There is no doubt that the Christmas season is upon us and Novotel Manila Araneta Center officially kicks off the holidays in this part of Quezon City! 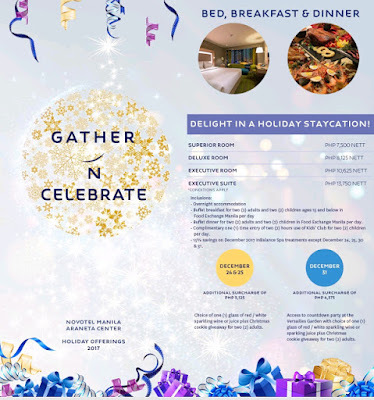 And since spending some time with friends and loved ones is an integral part of the yuletide season, Novotel Manila Araneta Center makes it all easier! Christmas carols are a traditional part of the Christmas celebration and for this year, Novotel commissioned Margaretha School for the Blind to serenade guests. It is that special time of the yeat to Gather N Celebrate at Novotel Manila Araneta Center once again. And The Food Exchange Manila offers a fantastic buffet spread. feast on international and local holiday favorites with family and friends. Rows of sumptuous good eats lined up for the taking brings the holiday cheers to guests and patrons. There is a variety of bread, cheeses and salads to start with, located at the left wing. The Carving Station boasts of Lechon (roasted suckling pig), Canadian-Style Herb-Crusted Prime Rib and Herb-Stuffed Roasted Turkey. Craving for paella? They have the Sisig Paella and the Seafood Paella this season! Don't miss out on Chili Crabs, Lechon macau, Sui Mai, Dimsums and other skewer foods from here and abroad. Of course, any degustation wouldn't be complete with sweets to cap off any meal! Do check out the aisle of cheesecakes, pannacota, waffles cones, ice cream, dried fruits, nuts, gummy bears plus the chocolate fountain was hard to resist. The fondue section is a huge hit with the kids! You can find halo-halo, palitaw, puto bumbong and churros from their extensive desserts line up. 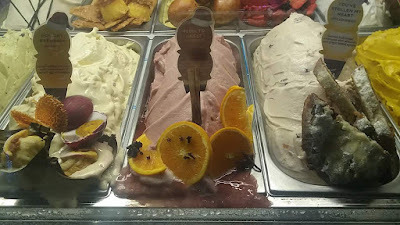 Ice cream fanatics will love the artisanal flavor combinations that Ice N Cream has in store---ranging from Classic, Philippine Flavors, Sorbets, Alcoholic and Sugar-Free. They have added four (4) new flavor to spice up the holidays and trail blaze you to a sweet end! The limited-offer holiday ice cream flavors are Holiday BAEbingka, You’ve Stollen My Heart, Holi-nuts, and REDdy to Jingle! 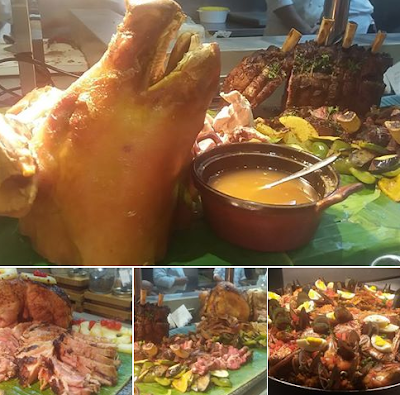 The Festive Buffet at Food Exchange Manila starts from P 1,888 nett. The Food Exchange is located at the ground floor of Novotel Manila Araneta Center, General Aguinaldo Avenue, Araneta Center, Quezon City. You may call 990-7888 for reservations and for more information. Do visit NovotelManilaAranetaCenter for updates.